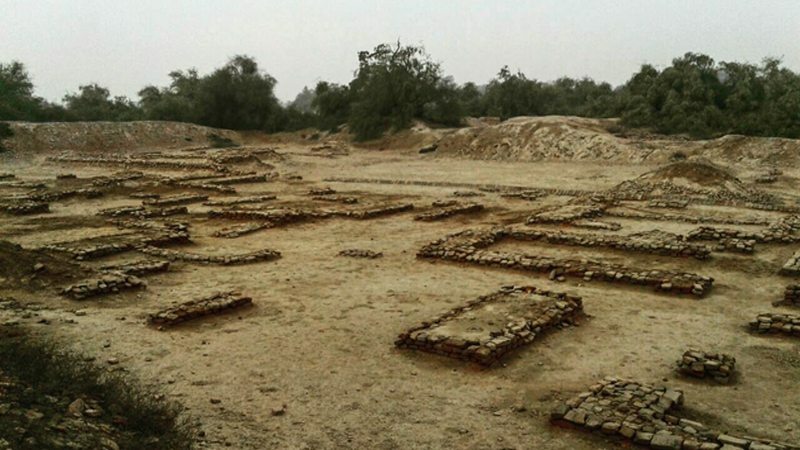 We made our first stop of the trip at Harappa, located near Sahiwal in Punjab. The archaeological site is part of the Indus Valley Civilization that spreads across Afghanistan, Pakistan, and India. In Pakistan, remains of this civilization dating back to 3300-1300 BCE have been discovered in different parts of Punjab and Sindh. It is believed that Harappa used to house around 23,500 residents in clay sculptured houses (spread across an area of 370 acres) during the mature Harappan phase -which is a considerably large number. Mohenjo-Daro in Sindh was the second discovered site of the Indus Valley Civilization; it is one of the largest excavated settlements of this civilization. A lot of similarities have been found between Harappa and Mohenjo-Daro. In terms of city planning, both these settlements had significantly similar living quarters with flat-roofed brick houses and similarly structured administrative/religious centers. There is not much left of the ruins in Harappa. The place was heavily damaged under the British rule in 1857, when bricks from the ruins were used as track ballast in the construction of Lahore to Multan railway line. The bricks discovered were made of red sand, clay, stones and were baked at very high temperature. There was also a plan to build an amusement park at the site in 2005, but thankfully it was abandoned after a plea from a Pakistani archaeologist, Ahmad Hasan Dani, as some precious archaeological artifacts were discovered in the early stages of construction. Such is the state of affairs of almost all the heritage sites all across the country. Without proper maintenance and repair it is only a matter of time that all this beautiful architecture and history turns to dust. There is a museum in Harappa as well, where the artifacts excavated from the ruins have been put on display. We were not allowed to take pictures inside the museum, so could not capture the artifacts on camera, but the list comprised of stamps, pottery, jewelry, skeletons, weapons, and miniature toys etc. Copper was used in making weapons and cutlery, as well as mirrors (because of its shiny texture) during that time period. Many seals found at Harappa and Mohenjo-Daro have pictographic inscriptions on them, which is believed to be some sort of a script. Philologists from all parts of the world have made several attempts at deciphering this language, but have been unable to do so, despite having access to various modern techniques. The Harappans used to bury the dead with their personal belongings, pots, and food items. Kids were buried in pots with all their belongings. These people had a strong belief in the after-life, and buried these items so they could be used when the dead came back to life. Remains of the skeletons discovered from the cemetery at Harappa were on display at the museum as well. There was a skeleton of a woman who is believed to have died during childbirth, her baby was also buried with her. This woman was wearing ivory bangles, due to which it is assumed that she belonged to the upper economic class. There was a skeleton of a man on display too, who is believed to have died in combat, as there was an axe wound in his forehead. The tour guide told us that there are several possibilities that could have led to the destruction of Harappa, which include: plague, change of the route of river, conquered by enemy.According to research the most probable cause seems to be disease and illness, as analysis demonstrated presence of leprosy and tuberculosis in the city. Signs of preferential treatment were also discovered, as people belonging to lower economic classes did not get access to basic facilities of health and security. You get to see many interesting tree formations in Harappa. This one looked like a cave from outside, and a piece of abstract art from inside. This was a very beautiful spot to have a picnic party, or just to sit down and relax for a while. While we were driving through the market of Harappa, I saw my name written on a sign board. We turned back to make sure what it was, turns out it was the entrance of an ‘Aneeqa Rose’ beauty parlour. Aneeqa is quite an uncommon name in Pakistan, and I have had a chance to come across only a few of them in my lifetime. I was certainly not expecting to find a parlour named after some Aneeqa, in Harappa of all the places. This definitely called for getting off the car and getting a picture taken with the signboard. Published in Daily Times, November 13th 2017.